Since the late 1970s a number of regional developments have impacted upon South Korea’s political and economic standing in Asia. China’s spectacular growth and closer integration with its neighbouring economies, along with a tendency toward more assertive political and diplomatic activity, have deeply altered both the economic and political East Asian environment. Simultaneously, the 1997-98 financial crisis catalysed a process of increased regional co-operation in East Asia. China’s rise has imposed a leadership problem that may constitute a major obstacle on the road to deeper regional integration, as well as add force to the need for collective action, and it is this paradox that may give South Korea a key role in the reorganization of the region. Moreover, inter-Korean relations and Korea’s future security environment may also feel the effects of the rise of China. Korea in the New Asia seeks to analyze to what extent and how South Korea may contribute to, and take advantage of, the new regional configuration in East Asia. 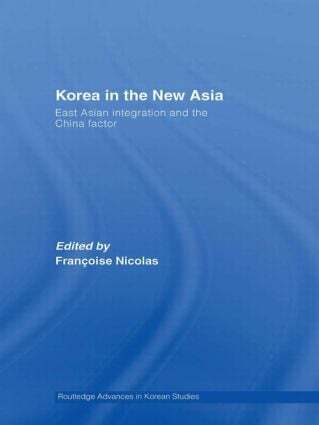 The book represents the first study to address Korea’s regional policy responses to the rise of China as an economic power and the regional economic integration of East Asia. Written by an international team of experts, this multidisciplinary study will appeal to researchers, academics and students with an interest in international relations, security studies, economics and East Asian politics. Françoise Nicolas is a Senior Researcher at the Centre Asie of the French Institute of International Relations (IFRI), Paris, and an Assistant Professor at Marne-la-Vallée University (France).